As President of Family Promise I feel responsible to our homeless guests, volunteers and donors to make sure we are delivering a valuable service that makes the largest, positive impact possible. In this role, I attended a community summit to examine how we can promote life success by improving graduation rates. 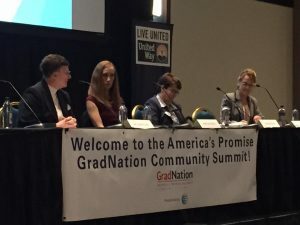 AT&T sponsored the event called GradNation which was organized by the United Way of the Wyoming Valley in cooperation with Colin Polin’s organization, America’s Promise. The keynote speaker was Dr. Leonard Sax who authored several books including “Why Gender Matters”, “boys adrift” and “girls on the edge”. Dr. Sax showed statistical based evidence comparing students’ performance on a standard measurement test. Students who are from low income families (measured by whether they receive free/reduced school lunch) score about 18 points below the children who were not eligible for free/reduced lunch programs. But the really surprising statistic was the new phenomenon that boys (of any income) also scored 18 points below girls. Dr. Sax contributes the boys’ dropping academic success to several factors including that schools have become increasingly “unfriendly” to boys. For example, fear of liability and law suits have caused many districts to adopt strict rules like; no throwing snowballs. These new, “no fun” rules often come with suspensions and other punishments that negatively impact boys’ view of school. But schools are not solely to blame. Dr. Sax warned of the statistical evidence relating to the negative effects of video games. Parents need to limit gaming to under 6 hours per week. Parents should also carefully consider scientific tests related to Mature-rated games. Three years of playing mature content games in which a moral inversion (Grand Theft Auto, Halo, etc) is required to excel in the game led to increased levels of selfishness, dishonesty, and hostility. The personality change was so great that dishonesty and hostility levels were equal to levels of children who are raised in violent households. “Good” parents who love their children and would never permit physical abuse are unknowingly allowing their sons to suffer the same traumas to their developing psyche as children who grow up in extremely abusive environments. There is hope. Because boys who played sports related video games like Madden football did not display a moral decline. The opening keynote definitely encouraged attendees to take a hard look at academic achievement among boys as a high impact activity for improving graduation rates. Being a boy in a PA classroom should not be a disadvantage. Regarding boys, Dr. Sax’s advice was simple. Encourage school administrators and teachers to look for safe opportunities for “boys to be boys” and as a parent limit gaming to under 6 hours per week and consider prohibiting moral inversion games. As board members and volunteers we need to ask ourselves what we can do to improve the academic success of the Family Promise kids. We can “hand out fish” forever or we can make a conscious decision to “teach our guests to fish.” Improving academic skills is the ultimate “fishing lure” that will improve kindergarten readiness, grade level reading ability and ultimately graduation rates for all impoverished families. If you are inspired to help Family Promise families academically, fill out the volunteer form today.